A Thought: From a Distance. Our perspective from a distance can change—sometimes we discern things more clearly—-other times we do not see details. 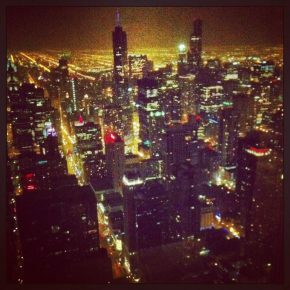 This is a photo taken atop the John Hancock building in Chicago several years ago when we were visiting Kara, who lived there at the time. What are you looking at in your life right now which may need a perspective adjustment? When we spend our focus in gratitude there is less room to complain. Let’s see how that changes our view no matter near or far. Happy Saturday!